On Tuesday, April 2, 2019, Prime Minister Abiy’s one year anniversary was celebrated at the Millennium Hall in Addis Ababa under the theme “ke Megabit Eske Megabit”, Amharic which translates to “March to March” (It is still March in Ethiopia). Senior government officials, diplomats and tens of thousands of people attended the ceremony and the Prime Minister made a little over half an hour of speech which was televised. “You Ethiopians can live without me. But I am nothing without you,” Abiy Ahmed told the crowd to express his gratitude for the support he enjoyed from Ethiopians in the course of the reform measure he introduced over the past twelve months. He cited the June 23, 2018 grenade explosion at Meskel Square in the capital Addis Ababa where he was speaking during a support rally in support of his administration, which was meant to be an assassination attempt, according to government narrative, on the life of the Prime Minister, and he thanked all those who paid sacrifice. Although there is a criticism against his government in relation to challenges to enforce rule of law and security problems, most people tend to agree that much has been achieved under his leadership. In the realm of foreign relation, one of the stellar achievements is the restoration of peaceful relation with Eritrea after 20 years of state of war. The two countries are now working on multifaceted regulatory arrangements which are expected to be signed by the leadership from both countries in the near future. In terms of domestic policy reform, Abiy Ahmed’s administration took measures along the line of broadening the political space in the country. Not only did he released all political prisoners in the country including those who were on death row on alleged charges of “terrorism” but also his government went beyond and above to negotiate with opposition groups, including armed ones, who were operating outside of the country. It did not, however, come without a problem. Some of the armed groups, like the militant wings of Oromo Liberation Front (OLF), refused to disarm once they arrived in the country. The group even went to the extent of taking over government administrative structures in some parts of the Oromo region of Ethiopia which triggered a military response on the part of the Federal government. Freedom of expression was another area where Abiy Ahmed’s government brought about concrete result although his government has recently been criticized for attempting to stifle resistance to the way the prime minister handled the politics of Addis Ababa and its surroundings. He has also introduced reforms, mostly personnel, in the security apparatus and defense force but like in other areas, institutionalizing the reforms has proved to be a challenge. He, in fact, admitted the difficulty of carrying out reform without reformed institutions in his latest speech from the Millinium Hall. He even asked Ethiopians apology for the things that he has not done without spelling out what they were. Yet, he mentioned the reasons why he was unable to; “circumstances” and “unawareness.” And it remains to be seem if he can influence the circumstances that were barries for making important decisions in the areas of enforcing rule of law, among other things. However, he outlined what his priorities are going to be in his second year in office and they are meant to address, seemingly, the challenges he was facing in his first year in office which were somewhat causing problems of public trust. Completing institutional change to ensure that reform measures are taking root and enforcing the rule of law and helping displaced people seem to be priorities in political and crisis management areas. In the realm of the economy, the tourism sector seems to be a priority for government spending so as to increase the revenue generating a potential of the sector. In that regard, he said that the National Palace would be open for the public as a museum which means that it will start generating revenue for the government. Agriculture with a focus on food security is going to be a priority as well. Irrigation will be a focus in terms of spending in the sector. Working on completion of mega projects, like the Renaissance Dam, is also listed among priority areas. Abiy Ahmed’s government has experienced a considerable skepticism from Ethiopians in recent months due to the action or inaction of his party, Oromo Democratic Party, on the issues of demolitions of tens of thousands of houses in Legetafo and Sululta, towns in the outskirts of Addis Ababa,a process which left thousands of Ethiopians homeless. 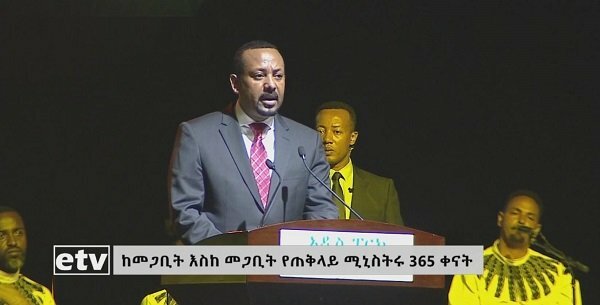 In his speech on Tuesday, however, Abiy made it clear for Ethiopians once again that he does not have a hidden agenda that could harm the interest of Ethiopia and he seem to have succeeded in gaining back a considerable number of Ethiopians who were on the verge of total skepticism towards his government. One Response to "Ethiopian Prime Minister priorities in his second year in office"
Mr. Prime Minister, please note that actions speak louder than words. Do not try to serve two masters: ethnic radicals and the country as a whole. If you try to please everyone you would end up in pleasing on one! !